IRS Form 8843 is a U.S. Department of the Treasury - Internal Revenue Service - issued form also known as the "Statement For Exempt Individuals And Individuals With A Medical Condition". Download a PDF version of the latest IRS Form 8843 down below or find it on the U.S. Department of the Treasury - Internal Revenue Service Forms website. For use by alien individuals only. Go to www.irs.gov/Form8843 for the latest information. b Current nonimmigrant status. If your status has changed, also enter date of change and previous status. See instructions. Of what country or countries were you a citizen during the tax year? 3a What country or countries issued you a passport? of these years changed, attach a statement showing the new visa type and the date it was acquired. calendar years (2011 through 2016)? . you meet the Exception explained in the instructions. establish that you do not intend to reside permanently in the United States. resident of the United States? . organization(s) listed on line 16.
described on line 17a and there was no indication that his or her condition or problem was preexisting. they are true, correct, and complete. and only 1/6 the number of days in 2015. Days of presence in the United States. 1040NR-EZ” on line 1a of Form 8843.
country at any time during the day. the date of change and previous status. residence in Canada or Mexico. with the requirements of the visa. shown in your tax return instructions. activities that are prohibited by U.S.
loss of your “J” or “Q” visa status. business on such a day. while you were in the United States. years. But see the Exception below. anyone in the following categories. • A student (defined on the next page). result in your being considered a U.S.
in a charitable sports event. fewer) of the 6 prior calendar years. States as a teacher or trainee. For more details, see Pub. 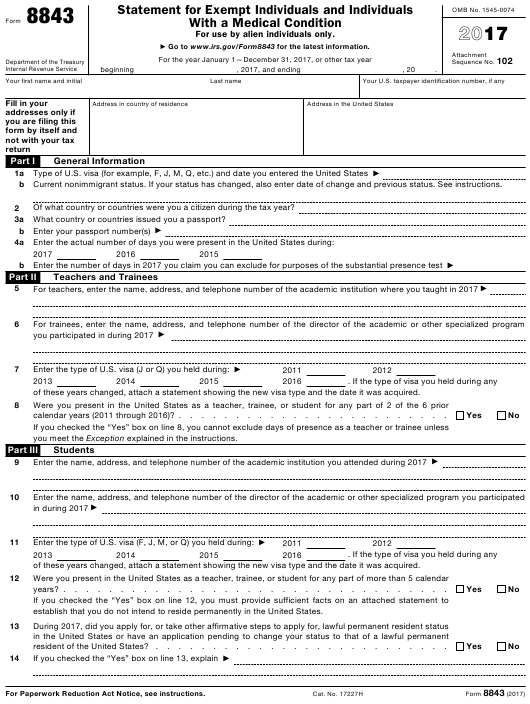 519, U.S.
complete Parts I and IV of Form 8843.
in activities that are prohibited by U.S.
loss of your visa status.